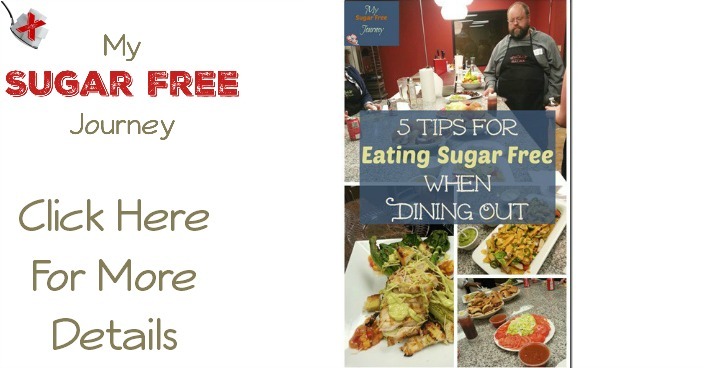 One of the trickier things about eating Sugar-Free is eating out. We don’t do it a ton but when we do, it took us a little time to see all the pitfalls and avoid them. I’ve been putting together lists of What is Sugar Free in Restaurants but even that is difficult because no one feels it’s necessary to publish the ingredients of their food and since there is no such thing as a “Sugar Allergy” it’s not on any allergen list. But over time we finally were able to pick our way through the sugary minefield that is eating out and developed a few tricks that served us well. I hop you find them as useful as we did. If I know where we will be eating, I try to call the day before and explain that I don’t eat sugar and get some advice about what to eat. What I found is many times I got something like “Oh, there was someone in a week ago that couldn’t eat sugar and we decided that she could eat x”. If that happens, life is super easy but if not, no big deal. 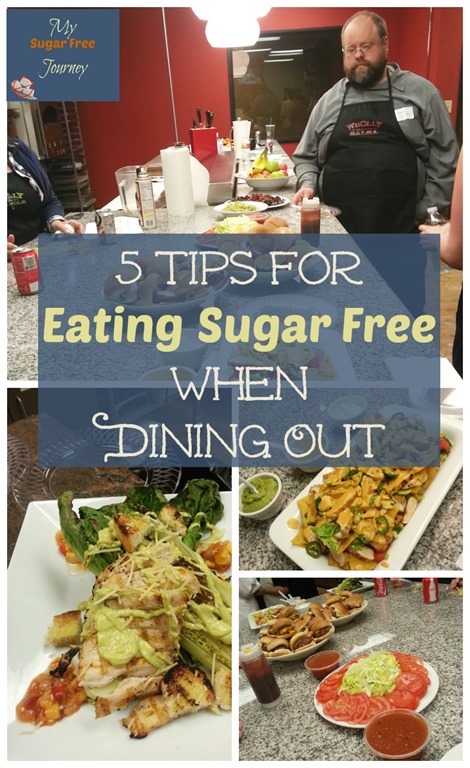 It usually just takes a few minutes to go through the menu and pick out the most likely no sugar added dishes. Unfortunately, it’s these 3 items that most dishes will fail the no sugar test. One of our favorite hamburger places has sugar in the seasoning for the fries, the little Italian bistro we like to go to has sugar in dang near every type of pasta sauce and salad dressing is just about impossible to find. All you can do is ask about each of these items and cut them if they have sugar. Fortunately, 2 of these 3 items have easy work-a-rounds. For the seasoning, just season your own food. Salt and Pepper are fantastic all by themselves. For the dressing, either bring your own from home (I know, we’ve become those people with little tupperware bottles of dressing in my wife’s purse.) Another option is oil and vinegar (but beware Balsamic vinegar, it’s got quite a bit of fructose in it.) or, in a pinch, just olive oil and a squeeze of lemon with a little salt and pepper. As for the sauces, it’s going to be tough. It’s sometimes easier to find white sauces without sugar as opposed to red but it’s a tricky find. If it’s leavened bread, it almost certainly used sugar in the recipe. Some flat breads (like tortillas) don’t use sugar but you can’t know for sure unless you ask. I’ve also found that if they bring out chips and salsa, you are usually ok. It’s been very rare that I’ve seen tortilla chips with sugar and if you are in a decent Mexican restaurant, there is probably no sugar in the salsa. This one is a little tricky. Usually, if the restaurant batters their own food in house, you are fine but if it’s pre-battered and frozen, you should avoid it. Remember all you CAN eat! This is probably the most important tip. It’s easy to get so focused on what is gone from your diet that you lose sight of what is still there. There is still a BUNCH of things you can eat and not feel deprived. Most importantly, you will be cutting out one of the most harmful ingredients from our modern meals and will be reaping the benefits of getting that poison out of your system. PREVIOUS POST Previous post: My Easy Sugar Free Taco Seasoning Recipe! NEXT POST Next post: Awesome Slow Cooker Sugar Free Chicken Stock Recipe! Thank you for the tips! I have to eat sugar free as well and have found it difficult to eat out. Have you ever heard of the book called Trim Healthy Mama? Their approach to healthy eating has a large focus on no sugar, so I think you would enjoy some of their recipes! The book was written primarily for women and moms in particular, but there is a growing number of men who have found success with it as well. Although it is very rare, I do have an allergy to sugar. That’s awesome! Glad you found me, let me know if I can help in any way. Most recipes are for families so you may or may not have any left overs depending on the size of your family. I usually do and have included left overs in this menu plan. If you are not feeding a family or at least 3-4 people, you may need to adjust recipes. I am allergic to sugar beet. So yes there is such an allergie. Sugar beet is in almost everything. I can only have pure cane sugar.